We were huddling close together to keep warm in a wooden cabin on the Annapurna Circuit trail in the Himalaya Mountains of Nepal at 3650 meters. The dark clouds were thick, the rain was not stopping, and the temperature turned minus. It was our third day and as part of our family time, we each of us took turn to share our feelings about our day. On our second day, thick black clouds rolled into the valley and it began to rain. 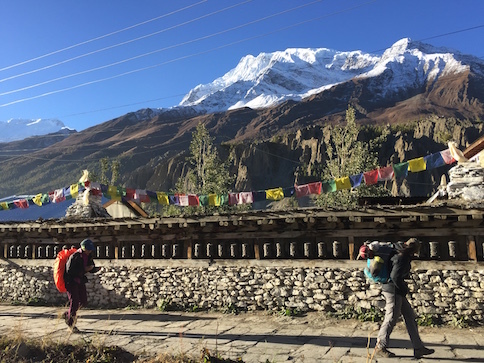 Earlier in the day, I shared with the children that today was exactly the one year anniversary of the tragic snowstorm that buried at least 43 persons who were hiking the Annapurna Circuit. Most died while crossing the highest pass of the trail at 5416 meters, which was the same pass that we will be going over in a few days. Olivia had to rest regularly in order to continue. “We need to rethink our strategy, kids. Today we had planned to only hike half of the distance of a regular day according to the Lonely Planet guidebook. But it took us close to twice the time. I am getting a little worry because the last three days will be much harder than today,” I shared with the children. On our first full day of hike, Joani was exhausted. Three days ago, we started our trek on the Annapurna Circuit. We were looking forward to it because we will be hiking higher than our previous record of 5145 meters in South America seven years ago. Joani was especially excited about seeing snow. 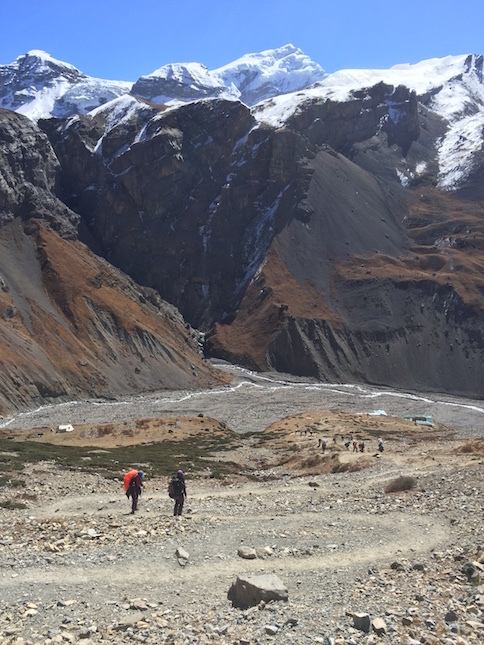 For me, not only were we challenging ourselves to go higher, we were also attempting our longest trek, a total of 8 days. Unlike before, we were doing this without a guide and without a porter. 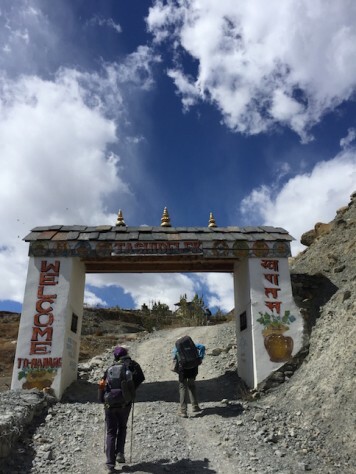 Fortunately, Nepal is well suited for long treks because every few kilometers, there are usually some tea houses or lodges where hikers can eat and sleep, so there is no need to carry heavy backpacks with supplies, tents, and sleep bags. 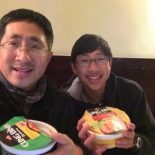 However, to save money, we still carried instant noodles, instant soup mix, chocolates together with portable stove, fuel, hot water bottles, and pots to cook part of the time. We also each had our sleeping bags and a floor mat to squeeze in more bodies in a room to lower accommodation cost. 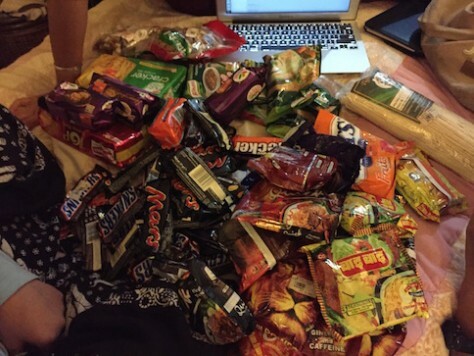 We bought lots of chocolate bars, instant noodles, and instant soup for our long trek. 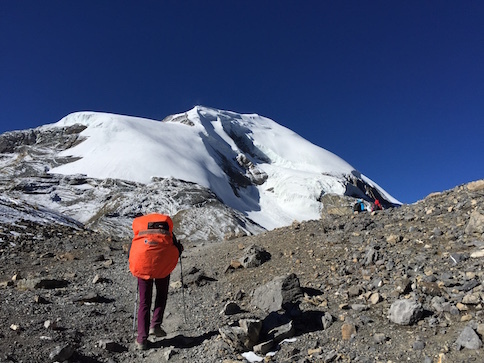 The end result was that our backpacks were heavy and we were struggling on our third day. The children fought earlier over who should carry the food bags. I was upset that I took so long to light the fire for the stove because of the bad lighter. Joani was upset that she lost her earphones in the the previous day in the hostel. Olivia couldn’t find her buff. We went on a side trail that was washed away by landslide and had to retrace our steps up the hill costing an extra hour. None of us was in a good mood. 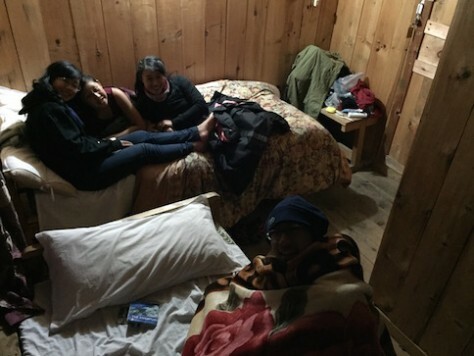 Every night we huddled in the cold wooden room. “So can someone help to wash these dishes please? Can someone fill these water bottle and put in the water purifying pills? Can someone ask for the extra blanket and pillow?” I asked the family. That night, to my surprise and my comfort, everyone shared the duties without complain. The next day, God gave us a big surprise. Unlike the cloudy sky the day before, the morning of the third day we were greeted with spectacular clear blue sky and white snow peaks. “Wake up dad. Look outside the window! I know you want to see this.” Nathan shook me from my sleep. I rubbed my eyes and grabbed my glasses. My jaw dropped down with disbelief. 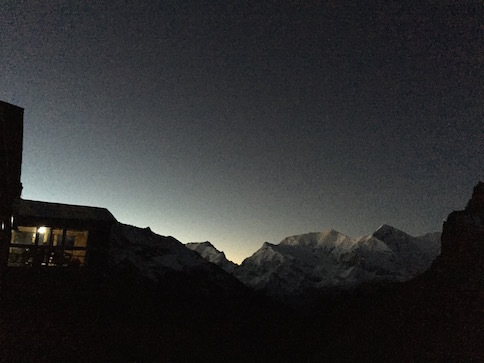 From the windows of our lodge, I saw from left to right a panoramic splendor of golden rays of sun reflecting off majestic snow peaks of Annapurna with absolutely clear blue sky as the backdrop. The low clouds in the previous day vanished and left instead a fresh layer of powder snow on the mountains. We couldn’t help to jump for joy seeing the mountain peaks in full view. Previous days we only had glimpses of the tall Himalayan peaks through the thick white clouds. It was frustrating trying to take photos when the clouds kept moving in and out hiding the elusive snow mountains. Today, the mountains was displayed in its full splendor without a single trace of cloud hiding it! For the next 2 hours, Nathan and I took photos after photos. We took photos from the bedrooms. We took photos on the rooftop. We took photos from the buckwheat field next to the Tibetan prayer flags. We took photos all along the trail. 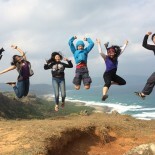 We took jumping photos, selfie photos, panoramic photos, groopics photos, videos, etc. 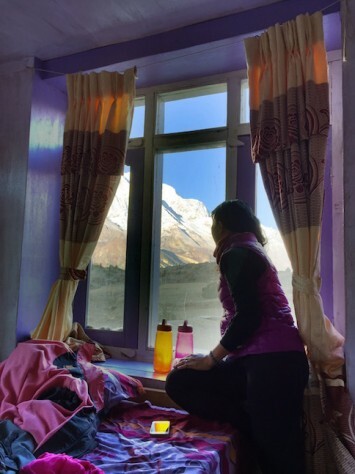 From our beds, we have a panaromic view of the Annapurna mountains through our hostel window. We couldn’t believe it when we arrived at our next pit stop, Maneng, by 2PM, more than 4 hours earlier than our previous day. It gave us time to buy gloves for the children and replenish our supplies of biscuits and chocolates. To our surprise, we arrived at Maneng at 2PM, much earlier than we expected. Choosing what to eat each meal was a science. 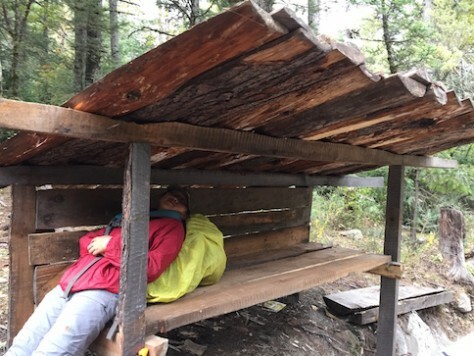 As it turned out, the cost of rooms on the trail was negligible, as rooms often were given for free as long as you eat at the restaurant of the lodge. The food prices however are fixed for each village and the higher we trekked, the higher the prices. It ended up that food cost is usually 90% of the expenses while lodging was just 10%. Initially, we were shocked at the prices which were 2-3 times higher than India. It was interesting to see how quickly we emotionally adjusted to the prices only after a few days. Each meal, we ordered food carefully that has the highest calorie per dollar. “Looked Dad, the pasta here is only 480 Rupees (in India, it was about 100 Rupees)! Cheaper than the last place.” Olivia said excitedly. 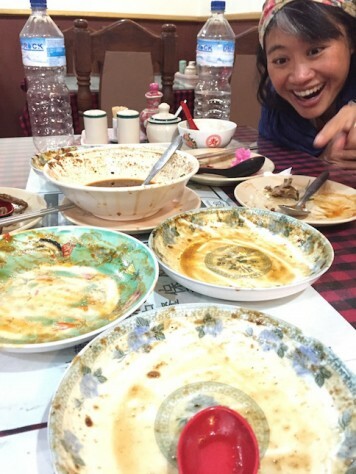 “We can eat more today,” Nathan said happily. “No, we still need to be smart about what we eat. Remember, pick the dishes with highest calories and the lowest price,” I reminded them. “Not fried potatoes and spaghetti with cheese again,” lamented Joani. We left Maneng early at 7AM to get a head start, the earliest that we had left so far. The next day, we woke up as agreed at 5:30AM and started trekking at 7:00AM right after breakfast, the earliest we had ever started. The sky was clear again and the morning sun bathed the snow mountains with its warm rays. Instead of spending time cooking our food with the stove, we changed our strategy to buying hot water at the tea houses to cook instant noodles and instant soup mix, eating them together with biscuits and some chocolates. Unbelievably, we arrived at our sleeping place at 1PM! We were all excited at our improvement. 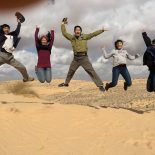 On the way, we met our first family trekking of four, consisting of the father, the eldest daughter, and two sons. 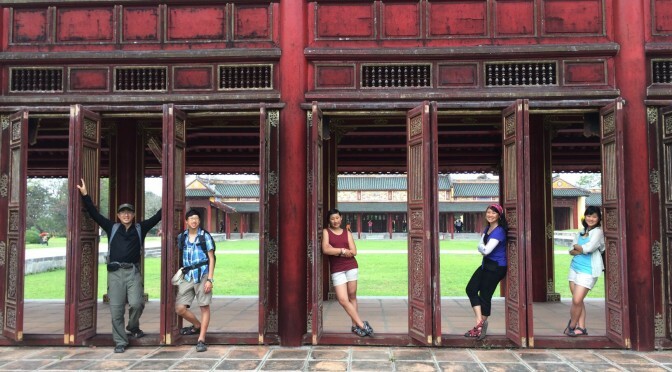 Although they were all about 6-8 years older than our children, we were so happy to meet another family and immediately bonded quickly with them. At the lodge, we got another surprise. 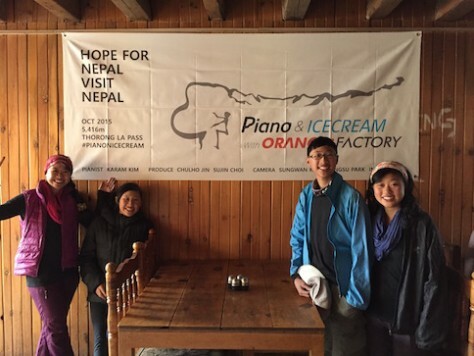 “What is this banner that says, ‘Piano & Ice Cream – Himalaya Piano Concert at Thorong La Pass 5416 meters’,” I asked the staff at the lodge. 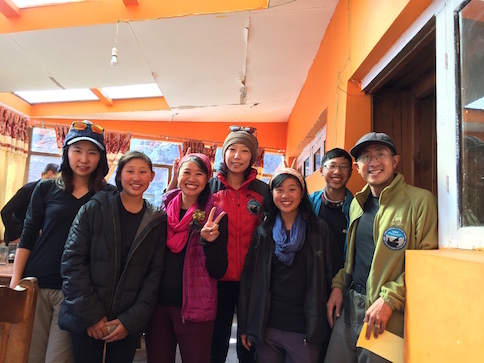 We were fortunately to meet the team that will attempt to play a piano concert at the Throng La Pass at 5416 meters to raise support for Nepal. “Oh, they are sitting there. 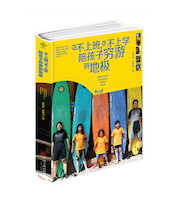 You can talk to them,” the staff pointed at a table of Koreans sitting around a table in the dinning hall. “How did you bring the piano onto the pass?” I asked next immediately. 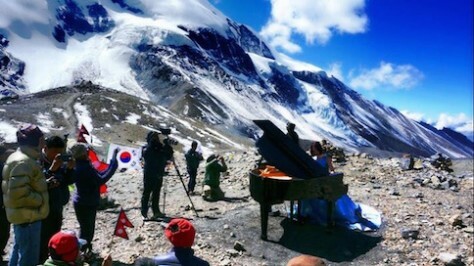 We were shocked to meet the Korean pianist celebrity at 4200 meters in the Himalayas. 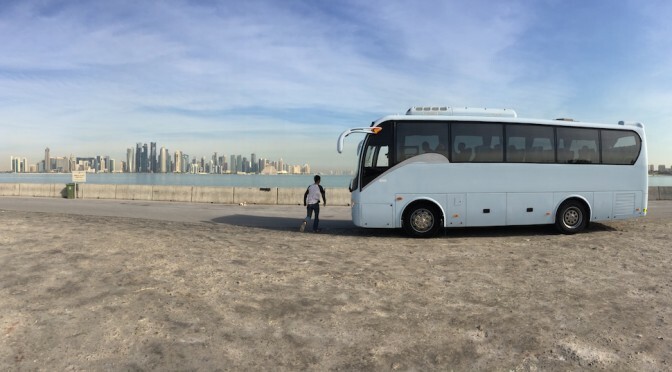 On our sixth day, we mentally prepared ourselves for a difficult long day. We were warned by many mountain guides that the second half of our hike today will be our steepest climb for the entire Circuit. 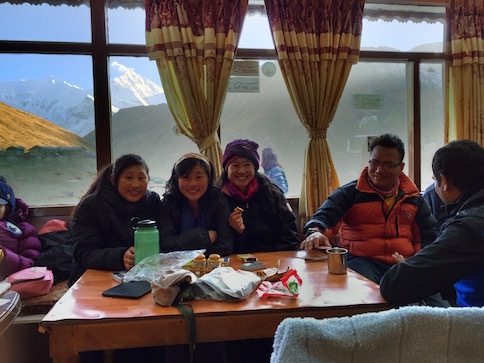 So as we did the previous day, we woke up at 5:30AM, ate breakfast at 6:30AM, and started our trek at 7AM sharp. The first leg was mostly uphill, as expected. After several days of trekking, each of us began to realize that going too fast resulted in being out of breath and unable to continue. Instead, if we steadily take each step slowly, one at a time, we actually don’t feel tire at all and can last for a long time without rest. We each felt an equilibrium among the step pace, breathing, and heartbeat. 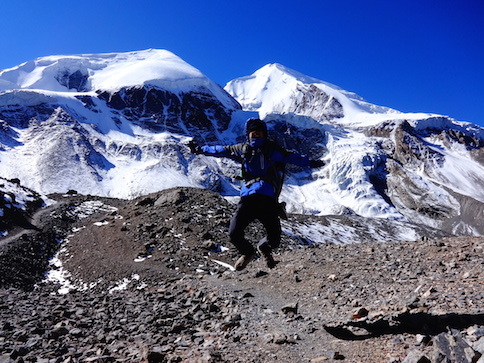 We were surprised how fast we overcame the steep climb from the Phedi Camp to the High Camp. The second leg was straight up a steep slope. It was so steep that we couldn’t really see the end of the path. After buying hot water again to cook instant noodles and soup, and eating most of our biscuits and some chocolate bars, we started the second leg. Each of us hiked at our own pace, one step at a time up the mountain. As warned, it was steep. However, to my surprise, Nathan and Joani went up faster than the rest of us that after 30 minutes, I couldn’t see them any more up ahead of us. I looked at my watch. We did it in just over an hour, half of the time estimated by the mountain guide! Joani and Nathan were excited at their accomplishment as well. “I thought today will be the hardest but we got here by 11AM! The earliest ever! Yahooo! High five.” Nathan yelled out with joy. Not long after, Annie and Olivia also reached the end. 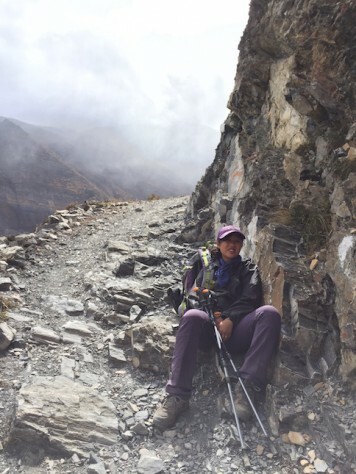 Using the hiking pole really helped Annie to relieve the weight on her knees. “This is like a rest day again. We can play cards all day today especially since today is our no electronics day,” Joani said happily. Arriving early to the rest stop means more time to socialize, rest, and play cards. 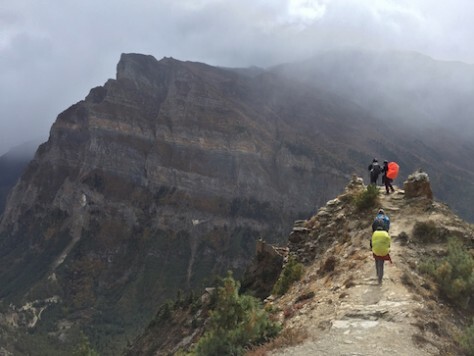 “Looking down from the top, each hiker seems to be walking in slow motion in sync, like the Japanese music group ‘World Order’! This is so funny.” I said. “We probably look like them, too!” Olivia reminded me. We spent the rest of the day talking to hikers from Sweden, Israel, Spain, US, German, etc. and playing cards with them. The children were proud that now they can talk with other adults as independent persons, not being part of mommy and daddy. 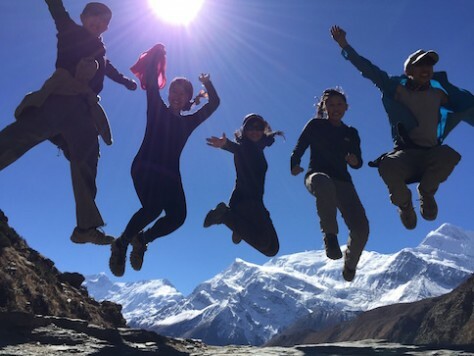 We felt the excitement in the air as everyone there knew that tomorrow would be the big day of hiking up the highest point of the entire trek at 5614 meters. 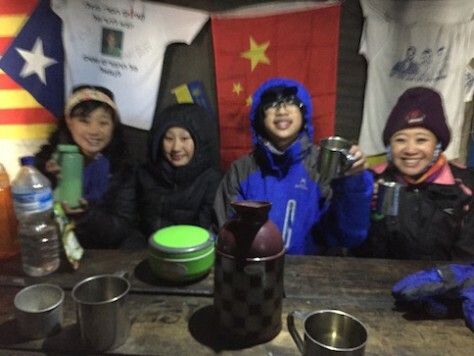 At the same time, there was nervous tension as well as everyone prepared to sleep early and wake up early to get to the pass before the wind become too strong or in case the weather changes. Around 5PM that afternoon, a heavy grey cloud rolled into the camp and for the first time in many days, we couldn’t see the mountains. In the back of all our mind was the tragic deaths of at least 43 hikers on the pass that we will be heading tomorrow morning. That night was very cold and now as a routine we each helped with the chores and went to bed at 7PM with all the clothes we plan to wear the next day on the hike and we prayed that God’s protection will be with us all. The snow mountain peaks greeted us early morning as we prepared to head off for the final trek over the pass. 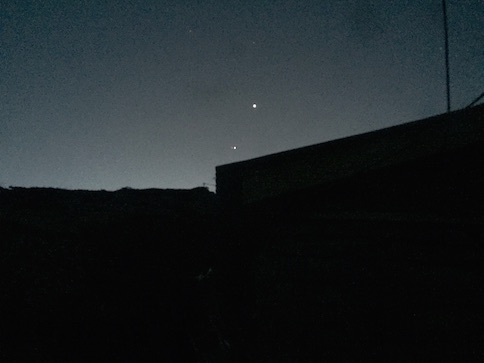 As we headed off early in the morning for the high pass, we were given a farewell by Venus, Jupiter, and Mars, shining brightly in the morning sky. We woke up at 4AM the next day. The sky was clear as we saw constellations and planet Venus, Mars, and Jupiter clearly on the night sky. That day Mars and Jupiter came the closest to each other in the last decade and became especially bright and visible in the sky. “Maybe that was how the Bethlehem Star looked like when the wise men followed it to find baby Jesus,” Nathan wondered. 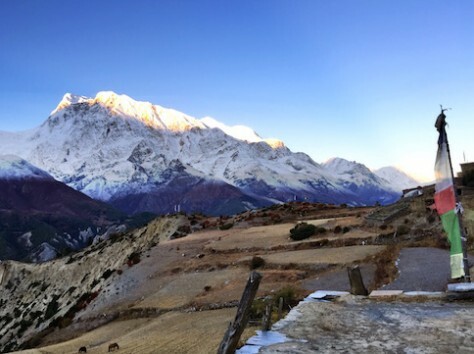 As we hiked one step at a time up the high pass, the sun slowly rose above the snow mountain peaks. It was so cold that the water in our water bottle froze into pieces of ice. 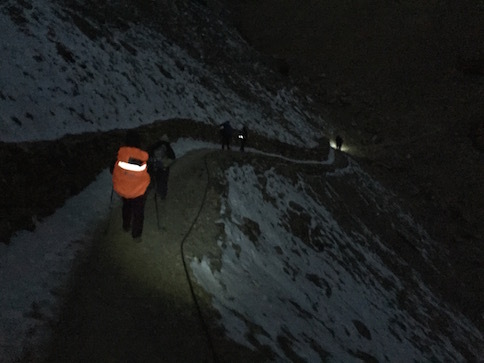 We started the trek with head lamps up to the high unknown. After an hour of climbing, we were surprised to see the Swedish family riding up the horse. Apparently, the eldest daughter and the youngest brother exhausted themselves to the point that they started to vomit. They got onto to horses that were waiting on the trail to provide “help” to those trekkers who are having difficulties, almost like vultures eyeing their prey waiting for the most opportune time. Surprisingly, Nathan and Joani again did well. Soon, they disappeared ahead of us three with other trekkers leaving us behind. Joani were excited to see snow on our way to the top. 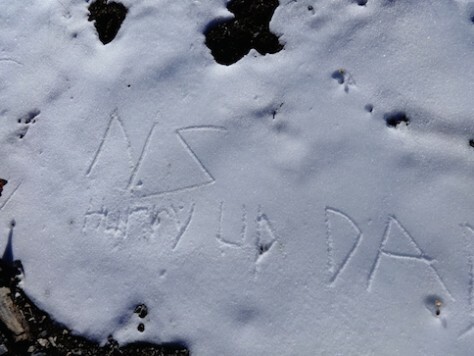 Nathan and Joani were so far ahead of us that they left a message on the snow for me: “Hurry Up Dad”. So Joani and Nathan rested and had snow fights. Meanwhile, Annie, Olivia, and I went slowly but steadily up the slope. Often we thought we had reached the top only to see that there was another higher hill ahead of us. When it looked that we were close to the top, there was another higher hill ahead of us. “Don’t give up! 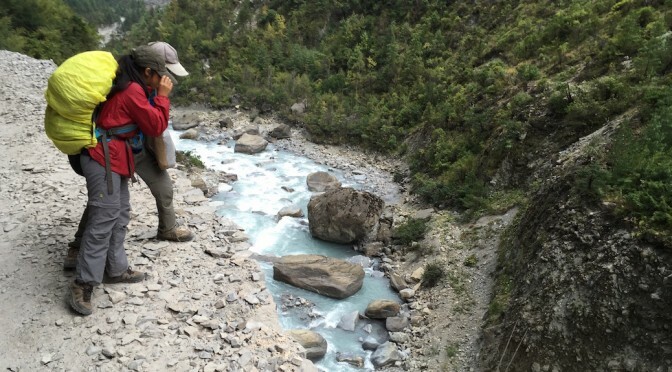 You are only five minutes away,” a mountain guide told us as he passed us by. I didn’t want to get my hope high but deep inside I prayed that it can be true this time. But true to the guide’s word, soon we saw a myriad of Tibetan prayer flags being blown by high winds in all directions. We made it! We did it in 3 hours to the top, one hour ahead of the estimated time. 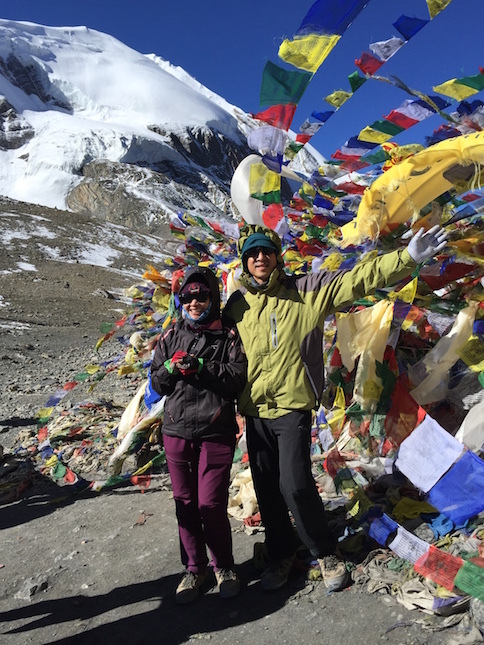 Prayer flags fluttered every directions at the top of the 5416 meter Throng La Pass. Nathan jumped up for joy with his full backpack at achieving the hike up to the pass. Nathan and Joani came running towards us. “We have been here for 30 minutes already. What took you so long?” they asked us. “Well…I accidentally lost my slippers and had to go back a long way to find them…” I replied sheepishly trying to find a good excuse to save face. 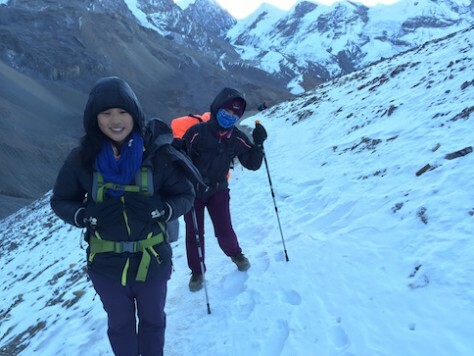 However, deep down I was very proud that we came together as a team and accomplished such difficult challenge without complaints especially considering how badly we started the trek. 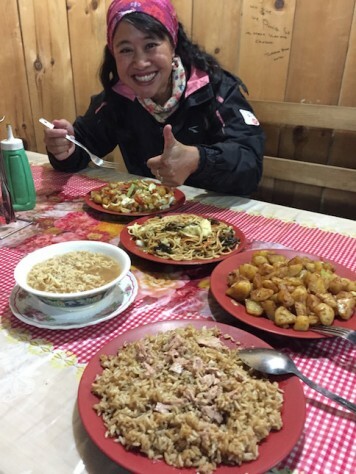 The howling wind and the sub-zero temperature had us quickly scrambled inside the small wooden hut for some hot soup. We haven’t had authentic Chinese for 4 months and it was not until we tasted did we realized how great Chinese food is. Not one drop of sauce was left. 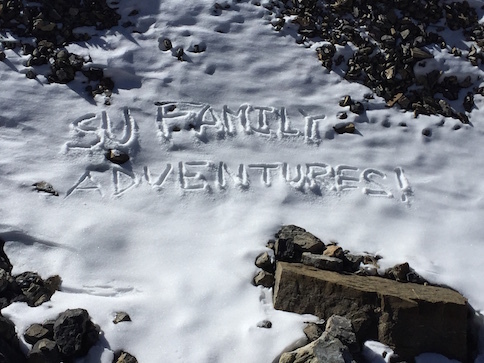 As a celebration, we etched our slogan “Su Family Adventures” in the Annapurna Circuit. From feeling like ‘dying’ to feeling ‘exhilarating’ in short 8 days, I would not be surprise if Nepal indeed became our favorite country! 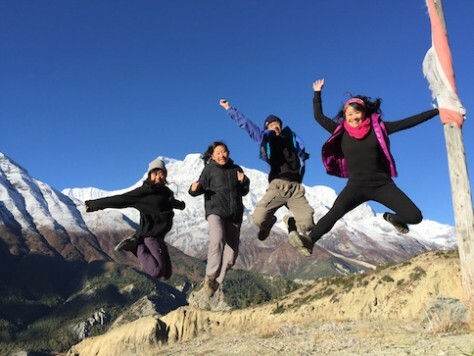 We love the Annapurna Circuit Trek! On Oct 21, 2015, the Piano & Ice Cream piano concert was successful held at the top of the 5416 meters pass to bring hope to the people of Nepal! See video of concert by a passing hiker. Excellent team work, Brother! Your family is wonderful! Thanks Gobinda, We really enjoyed meeting your family today. The way you lead your family in presentation and learning really impressed us. From your daughter, we can see how mature and joyful she is. May God continue to bless your family.